Safdie Architects has revealed plans to construct a fourth tower and music arena as part of expansion efforts for the Marina Bay Sands Hotel located in Singapore. 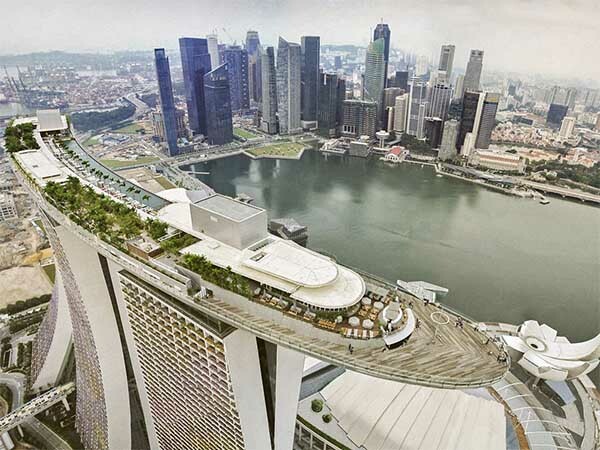 The new addition to the Marina Bay Sands Hotel will act as a stand-alone tower that will house 1,000 luxury hotel suits. The firm plans to also construct a dramatic atrium and terraces in the tower, as well as exhibition and conference rooms. Safdie Architects also plans to add an entertainment district with a music arena with 15,000 seats. The arena will be built with cutting-edge technology and will play a significant role in continuing to make Singapore an appealing tourist destination. Built on reclaimed land, the Marina Bay Sands Hotel – which is regarded as an architectural icon in Singapore – is a luxury resort complex composed of three 57-story towers. The striking towers are connected by a cantilevered sky garden, all of which have sloped glass facades. For the expansion, the architecture firm will retain a similar aesthetic with silver and glass facades in the construction of the new tower and entertainment district.